It’s the most powerful production car Chevrolet has ever made, and probably the meanest-looking. 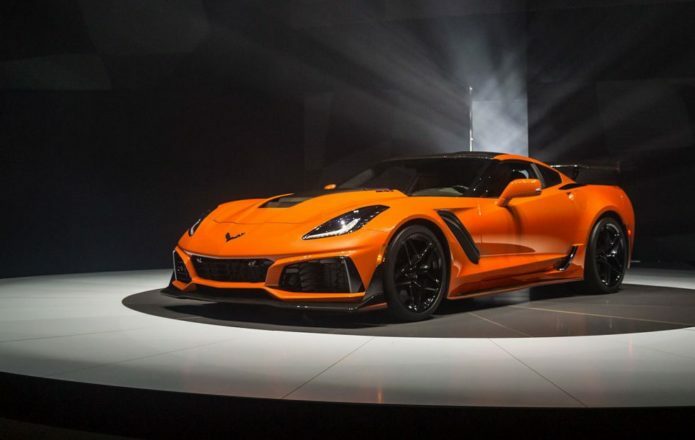 The 2019 Corvette ZR1 takes one look at the Corvette Z06 and decides “oh no, 650 horsepower just isn’t enough,” then goes about redesigning the powertrain, aerodynamics, cooling, and more to deliver a lightning strike of a car. In fact, there’s more than enough to shock you: whether or not you opt for the eye-searing Sebring Orange Design Package. A big engine under the lengthy hood of a Corvette is nothing new, but the 2019 Corvette ZR1 does do things a little differently – and more impressively – than the high-displacement cars that came before it. Chevrolet says the 6.2-liter LT5 supercharged engine is an exclusive to the ZR1, and there are some things familiar and some things new. The biggest surprise, of course, is the power. According to the SAE-certified testing, the Corvette ZR1 packs 755 horsepower, or 563 kW. That means more than a Pagani Huayra Roadster (with 754 HP), more than a McLaren 720S (with 710 HP), and more than a Dodge Challenger SRT Hellcat (with 707 HP). A Ferrari 812 Superfast will still embarrass you in the parking lot, but only by 34 HP. On the torque side, there’s 715 lb-ft, or 969 Nm. To get these crazy numbers, Chevrolet had to bring in a completely new supercharger that offers 52-percent more displacement than that of the old Z06 LT4. The LT5 also has a new dual-fuel-injection system, a first not only for Chevy but all of GM. This may not be the first Corvette ZR1, but it is the first to be offered with an automatic transmission. The standard 2019 ZR1 will come with a seven-speed manual, keeping the purists happy in the process. However, those who prefer paddle-shifting can now spec an eight-speed automatic transmission instead. The manual is no dumb stick-shift, mind. It features Active Rev Matching, which Chevrolet debuted on the current-generation Corvette. Basically, it predicts your next gear change and then automatically blips the throttle just before, to match the engine speed. That adds up to a smoother change when you release the clutch. 755 horsepower is plenty to get a 3,524 pound coupe going very, very quickly in a straight line, and the 2019 Corvette ZR1 doesn’t disappoint. Chevrolet says the car can exceed 210 mph, putting it in legitimate supercar territory. However, there are still some figures we don’t know. Chevy is playing the 0-60 mph and quarter mile numbers close to its chest right now. The guess is that the Corvette ZR1 will hit 60 mph in under 3.0 seconds, likely comfortably so. You’ll get a great soundtrack as it does that, too, courtesy of a brand new exhaust system. That automatically increases the noise levels the harder you push it. Do you want to go fast, or do you want to go around corners? Chevrolet isn’t quite making the decision as binary as that, but when you’re ordering your shiny new 2019 Corvette ZR1 you do have a choice to make. Do you pick the Low Wing, or the High Wing? That’s right, you can have the ZR1 in two aerodynamic configurations. The Low Wing comes as standard, and Chevrolet says it’s the design you want if top speed is your primary goal. Alternatively, you can specify the High Wing, which maximizes downforce and is optimized for going around corners at track speeds. Still, as you’d hope, that’s not to say that the converse isn’t true in either case. The Low Wing may not match its downforce-happy High Wing cousin, but it still offers a claimed 70-percent more downward pressure than the base aero setup on the old Z06. Meanwhile, the High Wing comes with summer-only Michelin Pilot Sport Cup 2 tires and a different front splitter, to go with its 950 pounds of downforce at top speed. Chevrolet may be talking up the 2019 Corvette ZR1’s biggest numbers, but the smallest are production goals. Only 2,000 to 3,000 cars are expected to be produced each year, in fact. The LT5 supercharged engine will be hand-built. It’s a boutique approach that in many ways is at odds with the “supercar for the people” strategy Chevy has long taken with the Corvette in general, but it makes a lot of sense for the 2019 ZR1. After all, when you’re sparring with the best from Ferrari, Lamborghini, and McLaren, having specialist engineers giving all their attention to building your car is pretty much table-stakes. There’s one big number we still don’t know. Chevrolet isn’t talking about pricing for the 2019 Corvette ZR1 at this stage, but the expectation is that, compared to its exotica rivals, this all-American hero will be practically a bargain. Figure on upwards of $130k to get one on your drive when the ZR1 goes on sale in the Spring of 2018.